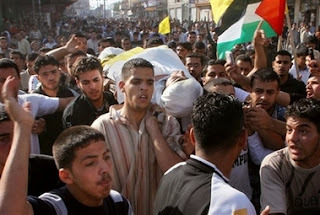 Clashes continued in the Gaza Strip overnight as the death toll from factional fighting rose to 40. At least 40 people have died in fighting in Gaza since factional fighting broke out on Sunday. Gunmen have killed at least 13 people in the latest factional violence in the Gaza Strip, ending a third attempt at a ceasefire in as many days. A dawn raid on the home of a top Fatah official left five people dead, only hours after the truce was agreed by the feuding Hamas and Fatah factions. Later Hamas gunmen ambushed a jeep and mistakenly killed five fighters from their own side held by pro-Fatah men. Some 40 people have died since fierce fighting broke out in Gaza on Sunday. Two members of the pro-Fatah Preventive Security force and a bystander were also killed in the ambush, in the centre of Gaza City. Militants from the hardline Islamist group also fired barrages of rockets at Israeli towns, an apparent attempt to draw Israel into the internal Palestinian conflict that has sent the coastal territory spiraling into chaos. One Jerusalem and Israellycool have extensive reports on the Qassam missile attacks on Israel. 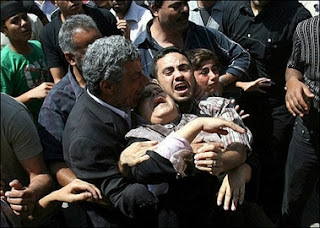 7 Dead in Gaza as Factional Violence Escalates!